Good evening, high in the mid forties today made an afternoon road trip to Duluth Trading store in Ramsey,NJ. (store opened in October) after receiving Email stating certain items were on clearance sale at 60% off marked price. Everything I was interested in was sold out so no new clothing for me . Checked their website once back home only small size left for shirts I was interested in Oh well wait for next sales notice. Icefisher-45 good to hear your insurance will cover the botox injections and spine surgery may both be successful in helping your condition. Whopper Stopper may you receive the low end of "Heart Attack" snow.Sorry your medication is not working assume it is for arthritis. Thank you for answering my questions have a great trip whenever you go may the girls get to meet their relatives. Since you have a good population of Swedish/Norway decent in Minnesota you should visit some restaurant and try a few dishes and the eat your favorites when on the trip. Enjoy the homemade ice cream should not take long to firm up in the Winter weather. Wallyworld glad you had a good trip and renewed friendships at the outdoor show. Mr.Turkey is correct about many businesses doing majority of their sales on-line so actual stores are not that large. Hope you enjoyed your first cone/Sunday of the season. Lil Maggot may you have had a good trip today. Ice Wanderer May the new Mexican restaurant last,what do you consider the "Big Town" guessing Warrensburg or Lake George. Eddie how was the fishing today did your grandson catch any fish. Hunts2long have fun training your grand puppies. Good to read your wife is doing well may Amber enjoy her belated birthday celebration. Tom Turkey happy for you medication took away neck pain. Nice story about ice fishing with your dad and brother. Your comment on Pizza reminded me of a show i watched on Food Network TV host was at a famous Italian restaurant located by several of the Hollywood film studio's . We he interviewed the current owner and asked why all their pizza's are squared shape he was told story of how her father made the first pie. the Bowery Boys were in town and filming a movie came for dinner and inquired why no pizza on the menu owner told them what is pizza so they described it all he had was a sheet pan to use for making the pie the place has stuck with sheet pans for their pizza's since then hard to think pizza was not a nation wide food item at one time. IFF sorry to hear another U.S. auto plant is closing. If you make the Kansas trip may you find the pan fish. FishinJohn looking forward to report on how your son's day was on the mat. Hope he received a trophy. Good fatherly advice nice that he thanked you for your help this season. A good night to all . Best to all fishing tomorrow. Marv I hope you did not get what we are getting. ICE no snow. I will take snow rather than ice any day. It looks like it is over for you for now. We might be out of it in an hour or so but there is a little coming out over that lake from Chicago. The wife just came home from bingo. She said one place was flooded and there was water out on the road from each side because of the snow banks. The trees are starting to droop from the ice. It's 25* and snowing this morning on my hill. And yesterday was a gorgeous day. Steve.........The big town is Glens Falls or city. people, and their 4 wheeler's or sleds. One guy after he got rescued took his boat and pushed the ice back to tighten up the gap to get his gear off. Eddie.........I'm waiting to hear how you and your son and grandson made out yesterday. John..........Congratu lations to your son making it to the states. H2L...........It's good therapy for your wife getting back in to the things she enjoys to do. Not much going on today with it snowing and all, we have conflicting amounts that we are suppose to get. I hope everyone has a good Sunday either at work or out on some ice. Windy and 27* this am, wet snow falling at the moment, plows are running. Last I heard was a chance of 1-3’’ before mixing with rain...high in the upper 30’s. Jeff...sure wish we could have taken my grandson up to LG for some perch, maybe next time. Steve...very slow fishing for us and most everyone near us yesterday. The little guy did land a bluegill though, and that made his day end with a big smile! Marv...Happy Birthday!! How was the home made ice-cream? That’s one thing I can’t ever remember making as a youngster. Hope the snow was on the low end...take it easy with the removal today. Tom...thanks for the link, crazy stuff, wow! That barge you fished as a youngster with your Dad must have been a great time, never heard of anything like that before! H2...good luck with the dog training, I’ve been helping my daughter out with that as well....German Shepard that doesn’t like to take orders from anyone but her, lol. Good luck with tonight’s bowling. Wally...any fishing plans for the week? Looks like some milder temps coming. Bud...unfortunate to hear of another plant getting closed down, so many jobs lost. Best of luck with the Kansas trip, understand the Crappie fishing is very good there. We were pretty well set up by 2 o’clock yesterday afternoon, nice weather conditions and just a light breeze. Set up on a weed line and just off it, figured we would have a busy afternoon for my grandson chasing down pickerel as is common there. We set up 12 traps and jigged.....hard to believe we didn’t get a flag to pop for the 4hrs. we stayed. Marked plenty of fish in the weeds, just very negative. Finally got one bluegill to bite and the battle was on for my grandson. Amazing what an 8’’ bluegill can do...high fives all around and lots of praise for his catch, he was stoked after that. Not much planned for today with the lousy weather, good day for soup and sandwiches...might try my luck with a pot of Minestrone, been craving that. Good Morning Everyone, Snowing here this morning but supposed to turn to sleet later on. Tom Turkey, I hope your neck is feeling better. IFF, Is the medication helping your leg? Hope everyone has a good day and a safe one. Well, we had a decent trip yesterday. Couldn't find any perch. Caught a few bass and bluegill. I would love to know what it was that almost took my rod into the lake! I was looking through the tackle box to switch lures when I heard a calamity behind me, only to turn around and see my rod all but in the hole! If I had to guess, I would say either a catfish or muskie, unless we had the rare encounter with a large Kahle Lake walleye. Looks like the ice will be done after this week. 50s and rain this week. We ended up with about 7" of snow well off the predicted amounts, which is fine by me. Before the snow got rolling in all it's glory we had a couple hours of sleet and rain, which kept the totals down. I was surprised at how well the stuff blew and scraped, not as heavy as I was expecting. The ice cream turned out perfect and yesterday we sampled it before putting it in the freezer for later today. It sure seemed the fitting thing to do yesterday when the snow was blowing everywhere. Not much going on today really. 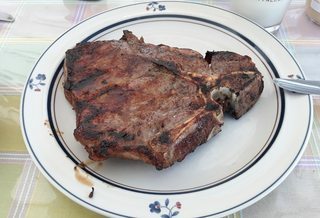 My wife bought me a big old T-bone so I have that to look forward to for later. Hope you all have an excellent day no matter what's on the agenda Stay safe, and Thanks again! Happy Birthday, WS! Hope you see many more! Marv: Birthday Huh, no wonder he made Ice Cream Helps the cake slide down. fisher-45 I keep telling myself it is....otherwise just funding the pharma company. Got some clock adjusting to do. then trip to pick up a new vanity faucet. Not much going on this morning other than scraping the ice off of where we park the cars. Most of the ice has melted off of the cars where the wind can get to it. It has softened up in that area so it will not be that bad of a job. No ice left on the trees which is good. Only a few small scattered power outages in the state. WS Good to here you did not get hit too bad. The temps here are guessed to get into the 60's on Thursday. Time to get tow work on the parking area as the wife is at a friend of hers planning a spring bazzar they are putting on at and for the local VFW. They have put on fall bazaars for VFW the last couple of years. TT.. I did read your one post on daylight savings time... personally I wish they would just go down the middle and give us a half hour and lose a half hour and not change the time anymore.. at 12 make it 12 30 and be done with it..
WS.. happy belated birthday!!!! I hope your year number 61 is a great one!!!! Eddie.. Some times I like those days on the water where ther isnt much action and you can just really enjoy being there with company.. I bet your grandson will have that day in his memory bank for the rest of his life!!!! Way to go grandad!!! What a day full if lots of emotions for my son and i both!!! To make a long story short.. He lost first match putting him into losers bracket.. Battled all afternoon and ended up taking 5th.. which is one place better than last year... soo proud of him to be a returning state podium finisher!!!!! I asked him if he wanted to wrestle more this year.. he said... no dad.. I'm done.. now it's time for baseball!!! McDonalds in that town just before turning into McDonalds parking lot notice two dogs running unleashed along side of the road. Before I was parked another vehicle pulled in and a woman got out she was able to get one of the dogs to come to her and put it in her vehicle. Other people around so I go inside to get my breakfast when I come out still had not caught the other dog. Lady is on phone with local police they tell her no officers available to come and pick up the dog call local humane society. She called the humane society which said they would accept the dog she could drop it off since she was running late for work we transffered the dog to my vehicle and I drove to Human society. The dog was an older female black lab very sweet and never barked on trip to shelter. After dropping off the dog headed back to McDonalds to see if other dog was still in the area notice motel behind McDonalds stop in and talk with desk clerk to see if they knew anything about a missing dog gave him humane society's number in case someone inquired after walking back to my vehicle figured i should let police know the one dog was at shelter talking with the dispatcher found out other dog had been captured and returned to owner who lives near motel and they knew lab had been taken to humane society. So I walked back into hotel to update the desk clerk. Glad both dogs are safe this McDonalds is off of a state highway right by an exit for interstate 84 so high traffic. My egg,cheese and bacon McGriddle with hash brown ended up being my lunch. Whopper Stopper Happy Birthday enjoy the T-bone is your wife baking any special cake for you. Good you received less snow then what weather guessers had predicted. Tom Turkey glad your with got home safely from bingo last night. All the best to her with the Spring Bazaar. Ice Wanderer thank you for the reply to my "Big Town/city "question .While making a trip to Fish307 at their location on rt.9 stay at the Econo -lodge in Queensbury you probably know about both these places The "Silo" on aviation road and Sutton's market on rout 9 good food at both places. I went to Fish307 to look at and enede up buying Arctic Armor suit back in 2008. Eddie surprised your location did not yield any chain pickerel glad you grandson caught the bluegill. May you all have more action on next fishing trip. Icefisher-45 similar weather by me be cautious if you and the family due any traveling today. Lil Maggot good to read you caught some fish even if they were not the yellow perch you were targeting.Possibly one more week of ice fishing left by me the Proverbial "Fat Lady has started to sing. Wallyworld may you have been spared any major snowfall from this storm. FishinJohn I see you just posted a big and congratulations to your son. If he continues wrestling maybe next year he will finish among the top three in the state. No shame in 5TH place and being among the medal winners both times he has qualified for the state tournament. Best to him and his team this baseball season. A safe and good Sunday to everyone . best to those fishing. 35* with some fairly strong winds this am, 15-25, high of 38. Looks like a pretty warm week coming up temperature wise...40’s, 50’s and 60 on Friday with some rain. Steve...way to go helping out with the dogs, glad both were saved and not victims of a car accident. John...what a great finish for both you and your son, superb!! A big CONGRATULATIONS to him on his achievement and to you also being his driving force...GREAT JOB DAD!!! Big fan of youth baseball, will be looking for updates if you ‘’swing’’ by during the off season here....we’ll be here! LilMag...nice job on the fishing, thanks for sharing your trip and great pictures! Marv...hope you had a great day yesterday...how was that steak?? . This time change is definitely going to take some getting use to.... . Agree with John, move it a half hour and slap the lock on it....done! A bit behind this am....Thank You for the kind words fishing with my grandson...we had a fun trip. Will check in later to see how everyone is doing....Cawfee’s on! 12 heading into the mid 20's today, now the talk is flooding as the week comes to an end. By Wednesday almost 50. Eddie hope you and the crew have a good week Sir I agree the time change will take some getting use to. mr.clean no special cakes, we just settled for the ice cream. After eating that I was more than content to hit the chair for a couple of hours. Today mid morning I have to go in and see the therapist, I am guessing he will give me more stretching exercises. So far I have been keeping up on what he wanted me to do, just wish I didn't get so stiff after every session. I will have to ask him about that. to town get some gas and run a few errands but would come over and plow my driveway, he did just that. Eddie........I think next year your grandson will be ready for a trip to LG for both Perch and Lakers. John.........Congratul ations to your son for getting on the podium. I think it's smart of him not to go, he could burn himself out. It sounds that he wants to be an all around athlete. Steve........Good job helping out with the dogs, how was lunch, did it taste OK after all that time. get as much snow as predicted. Tom...........All the best to your wife and friend planning the Bazaar. Do the proceeds go to the VFW? I have another PT appointment this morning, I did my therapy at home as much as I could, I want to break the record for recovery. I'm not over doing what I do at this point, basically I am just doing loosening of the shoulder so it doesn't get stiff. I see WS posted while I was typing, Good morning sir. I hope everyone has a good Monday either at work or at play. Jeff, might be just have to let the body and time do its own healing. Has everyone given up on ice time this season ? Think I have, but may be a while before my local lake is completely ice free. One report was an undersized male walleye was already milting that was caught Saturday. Almost NCAA March Madness time again. 36* clouds and some wind. WS, glad you had a great Birthday. The steak looked good. John, Congrats to your son and hope he has a good baseball season. IW, good that someone got the driveway cleared for you. May make a pass or two on mine this morning, just to get some black-top showing. Well, bowling season is over. We had to take 2 points to win 2nd half of the season. We loss the first two games, so then it was down to win the last one to force a tie and a one game roll-off last night. We loss the 3rd game by 6 pins. As a team we bowled pretty good but they just bowled better. The season champs are the team that the wife bowled with the first half of the season. She will be getting some prize money. We should begin to loose some of our snow...lol...as I typed that I looked outside to see snow flakes. They won't last. The lake has been dropping about 3 inches a day but it has a long ways to go to get to normal levels before they start rising it in April. Eight weeks from this pass Sat. and walleye season is upon us. Tropical heat wave. 27* this morning. I do knot know if I was pushing more ice or water yesterday when I cleaned off the parking area. Sunny today so that should help with the snow melting. I will welcome the guessed 60* on Thursday if it happens. All of the money that is made at the bazaar goes to the VFW. This is the first time she has helped put on a spring one. The ones she did in the fall were very successful. They charge way less than most places for a table letting the vendors make more money. The wife has been active with a lot of veterans organizations. Her father was a WWll vet. He started a VFW post in Grand Rapids. Her late husband was a disabled Navy vet that worked as a case worker for the DAV. WS A belated happy birthday. That steak looks delicious. BTW I think I found your place on bing maps. If that white spot way back by the woods it is a longways to haul wood in the winter. We have a Higgins lake here in Michigan. It has some lakers I believe but also has a lot of smelt that are caught through the ice. Good Morning Everyone, Warm out this morning in the 40s. Going for Botox injections tomorrow morning. I hope everyone has a great day and a safe one. 27* with same windy conditions as yesterday, high of 35 here today. I-45... hope all goes well today! Tom...best of luck to your wife on the bazaar, hope it’s a huge success! H2...so close with the bowling, dang! Congratulations to you and the team, you guys did well battling all season! Wally...thanks, my grandson is hoping to get back out there one more time. Will have to see how the ice is holding up after this weeks thaw. Shouldn’t be too much longer before the boat launches are ready if this weather hangs around. Bud...not ready to call it quits here yet....lots of ice if the shorelines hold up. Will be looking forward to the March Madness games again....maybe some help with my picks? Jeff...hope everything went well with the PT yesterday! Keep up the good work and that positive attitude! Marv....now that’s one fine looking steak, Yum!! Hope all went well for you yesterday also at the therapist...best wishes on your recovery. Early start with the hammer crew today, will check in at break to see how everyone is doing today....Cawfee’s on! It's 26* and calm here on my hill this morning. Bud.........There is plenty of ice here in the Adirondacks, Lake George should be good for another 3 weeks or so, maybe longer. I-45........I hope the Botox shots help! Eddie......Maybe your grandson would be ready for a trip to LG. Wally......I hope you have some better conditions at the boat launch when you get up there. Marv......I hope your therapy appointment went well. almost forgot that I had a problem with it. Not much going on here today, we do have little Carson to pick up from pre K, my wife really enjoys having him here. I hope everyone has a good Tuesday either at work or out on some ice! 19 creeping up to 40 later, all the talk now is rain and flooding. We have never had problems with high water but at the same time I hope the thaw is slow enough so the water has a chance to drain away from the house. Yesterday my PT went well. The therapist commented how well things are going based on extra range of movement. He wants me to drop a couple of exercises and replace them with a couple new ones, he also wants me to start walking again once the roads clear some. Until then it's back to my old buddy the elliptical. He seems confident stretching and core work will get things straightened out. Today I have to dig a couple of down spouts out and make sure they are in place to help. I also am going to double check a couple of snow piles to see if I should blow some snow away from the house. I am going to clear the gazebo roof as it has about 16" of snow on it. They say with the rain that's coming, many roofs will have over double over the weight on them as the snow soaks up the water before running off. Good Morning Everyone, looks like it’s going to be a sunny day. On my way for the Botox injections for my headaches. Whopper Stopper, Good the Pt is helping. Don’t overdue taking the snow off the Gazebo. Headed to take the wife for her preop physical in a few minutes so this will be short. WS and IW it sounds like you both have good physical therapists as you both are improving. I went and set for quite a while for some one to show up for the board meeting. The only ones to show up were the woman and her husband that are trying to get the short term rentals on the lake stopped. She finally found the meeting was moved to next week on Facebook. Whey not put a sign up at the meeting place stating this??? She gave me some petitions and a letter to go along with them. I have never read a better written letter of why they should not be allowed. It was written by a guy that lives next one of the rentals that has continuing problems with renters. They are actually illegal in Township Zoning. Two of the board members are violating this rule. The township is ready to pounce on the issue we are having. The petitions will just help them put a stop to it. I got looking at the last miuues posted on the website last summer. I saw that three memers of the five board are up for election next summer. Here is our chance to take control of the board back. One of them that faces reelection is one of the short term renters. I hope you can read between the lines. If I try and make a correction it erases what it had already typedso I have to type it all again. Is any one else having that problem? That is why the typedso is there so I did not have to type it all over again. She finally found the meeting was moved to next week on Facebook. Why not put a sign up at the meeting place stating this??? This past winter many of the resorts on Mille Lacs posted on Facebook alerting anyone that was on the lake to get off due to cracks or blizzards. Many spots out there don't even have a signal. I could be wrong but but if I saw a storm rolling in I doubt I would fire up FB to see what Martha has to say about it. Good day everyone partly clouds skies 42 with winds up to 10 mph at this time may see highs in the sixties before weeks end. Thank you to everyone for the kind words about the dog s glad things worked out and no accidents like Eddie posted. Eddie may you still be able to get on the ice this weekend for another trip with your grandson. remember the season for walleye and northern pike closes on Friday the 15TH. Whopper Stopper I think people who are heavy into the various social media sites forget not everyone uses them and that some folks do not own computer or only use their cell phone to make phone calls. The photo of steak looks great sure it was delicious . Good to hear the PT is helping your back . May the coming rain not cause you to many problems. IFF how did the new vanity faucet install go hopefully problem free for you. I see from checking Weather Underground you a due for a possible blizzard from Winter storm Ulmer may things not get to bad. Ice Wanderer Glad PT is also working for you must have felt good to get out of the sling for a few hours. You are fortunate to have the mechanic friend to plow out your driveway. You and the wife have a great day with little Carson. Wallyworld may the launches on Lake Ontario be open by the start of trout season so you and Mr.WW can pursue some brown trout. Looks like Old Man Winter is putting up a fight before exiting your area of NY. for Spring to arrive with warmer weather and no snow. Hunts2long congratulations to your bowling team, nice that your wife may receive some money . Icefisher-45 may the Botox injections help with your head aches and you have no side effects from them. Tom Turkey may the wife preop physical be good. Best to her with the Spring bazaar. Hope your town takes action on folks those doing the short term rentals. May some of your neighbors step up and run for a seat on the Assn. board this Summer. As you know from your wife's involvement not the easiest job. A safe and good day to all. Best to all fishing stay aware of the deteriorating ice conditions as the temperatures rise and start of Spring approaches. Steve, much to my surprise, I tried another stem from a different store and the drip stopped, so $40-45 ahead of the game. On the other plate. found my 2001 blazer is dying. antifreeze has been going where it shouldn't....in the crankcase., So for a while it will be the Silverado pickup will have daily duty.